I’ve updated most, if not all of the famous filming spots for the drama! They’ve traveled all the way from Quebec (Canada) to Incheon, Seoul, Yongpyong, Gochang, Anseong, Gangneung and Naju. If there’s any location that I’ve missed out, feel free to comment below and I’ll be more than happy to update! Any suggestions on the next big hit drama with beautiful filming locations? Don’t forget to check out my post on the filming locations of Legend of the Blue Sea too! View all locations (Korea) on Google Maps. 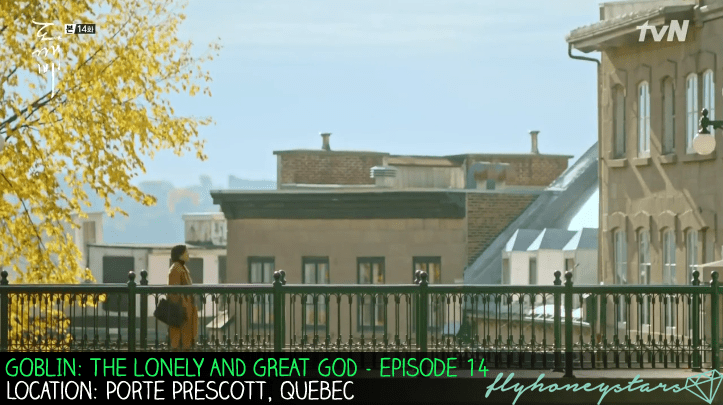 Check out my new post on the comparison of “Drama Footage vs Google Street View” for the scenes in Quebec! Would be useful if you intend to travel there. I hope that these information will be useful for planning your trip itinerary to Korea! I might be doing a map for these locations in the next few weeks so do bookmark this article and return! For now, I still do not have any information with regards to the interior of the Goblin House and the Grim Reaper’s Tea Room. I highly suspect they are studio sets or are at places not easily accessible by the public. Let’s see and hope that they will do an exhibition/showcase of the set when filming is over! This scene was right at the start of the episode where Goblin made the boy’s stepfather (who was abusive) trip and fall. Information Credit: Extremely lucky reader Alaniss (from Quebec) that left a comment in my blog post. She even saw the filming!! This overhead bridge has been featured countless times in the drama. It was also the bridge where Sunny and Grim Reaper first met. Location where he was ‘stabbed’ and the place he will return to when he dies. 고창 학원농장은 Gochang Hakwon Nongchang-eun (White Flowers/ Buckwheat Fields). Note: Type of flowers are seasonal dependent and the buckwheat flowers are only available during autumn. In summer, it will be sunflowers. Directions: Anguk Station, Line 3 (Orange), Exit 1. Walk along 4 Yulgok-ro 3-gil. Place where Goblin and bride met for the second time (1st time was the umbrella raining scene) after she blew the flames off her birthday cake. Take the bus to Gangwon National University, walk across the campus towards the direction of the sea and find a restaurant called “Haerang Pension Seafood”. The breakwaters is opposite that restaurant. The address below is for the exact stairs in the screenshot above. The entire shopping area that they hopped around from shop to shop in the episode is known as “Petit-Champlain District”. This park is the place where Goblin was staring at the Tombstones of people he knew. Note: The Tombstones were all props. It is located about 5 mins walk from the hotel. As seen from the picture above, you can see the hotel from the green pastures. This is very tricky. Different outlets of Dal.komm Cafe were used for different scenes. 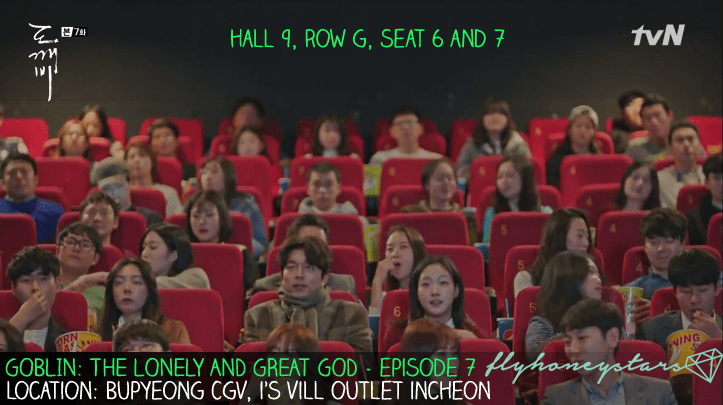 For this scene which involves the 2 grim reapers, it was filmed at bundang, seong nam city. To date, I haven’t found any information about the interior of Goblin’s house. I am really unsure if the filming is done inside this mansion but I don’t think so. Anyway, if you find this place familiar, it has previously appeared in 2006 Goong Drama aka Princess Hours. Workplace of Goblin’s Bride. This place was featured countless times with their brand name seen.. I supposed it is a sponsored filming location.. Many scenes took place inside and outside of this bookstore, especially the one where the lady in red confronted Goblin in Episode 8. This scene was when Goblin was summoned when the bride blew off a flame while grilling squid for her boss. Ji Eun Tak School (Exterior) – Seen when Duk Hwa fetched her to school in a flashy sports car. Restaurant they had breakfast at to watch some finale episode of a drama. Surprise Surprise! The Steak Restaurant which was supposed to be in Quebec is actually in Paju! Apparently this place had been featured in “The Heirs” before too! There you go.. the exact seat number they sat but according to the korean blog that I got this information from, this seat is usually booked.. right. Temple where Goblin set sky lanterns. Here’s one frame showing the prominent yellow walls. If you really happen to be going by this road, swing by the temple nearby – Woljeongsa It looks pretty interesting and it provides temple stays too! Alright pretty hilarious but the temple’s facebook page did a screenshot of the drama too. You can view it here. This place is somewhere around the bridge and it is alongside a “walking path” which brings you to the temple. The distance is about 1km if you walk the path up. It look so pretty in Winter but oh gosh visiting this place solely for the drama is pretty insane but.. who knows? When Goblin and Grim Reaper goes out to buy spring onion and they were blocking the path of a motorcyclist. Random Cafe (자작나무이야기) where Sunny and Eun Tak sat and talked. This place used to be like a foreigners club in the past and now it has developed into some heritage or cultural center.. If you’re wondering which room that stayed at, my guess is that it is the “Villa (Royal Suites)” as seen from the photos on the website. The room is 95 square meters and one night will cost you about 600,000W (USD $510). There are two Royal Suites so you might have to indicate a special request to the hotel (ROOM 502) if you prefer to stay in the exact same unit. If you don’t have the money to splurge, consider a deluxe room which cost roughly about 200,000W. The ratings for this hotel is pretty high.. in the 9/10 or 4.5/5 range. Please don’t judge yourself for wanting to do such ridiculous stuff. My friends and I booked the exact same hotel room for Onew’s One Fine Day Vacation in Krabi too. It is okay. 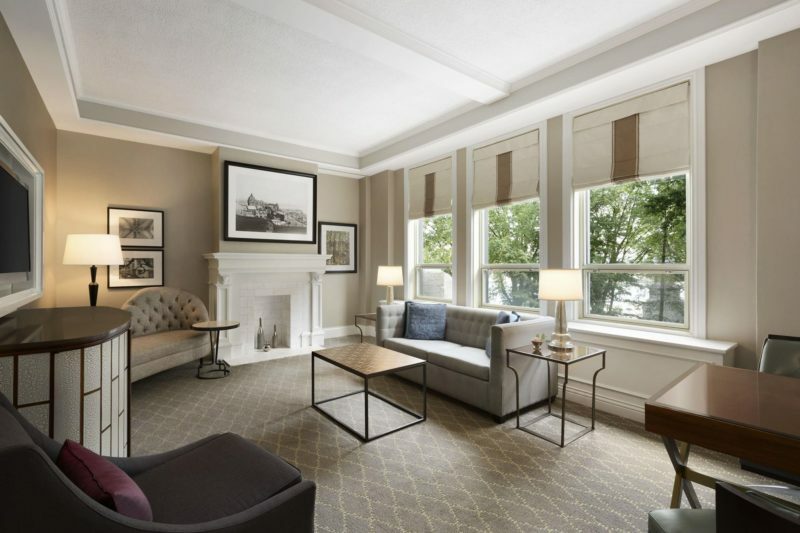 As verified by a Canadian Reader and the Hotel (thanks for replying), the filming is done in Frontenac Suite. Price for Frontenac Suite ranges from 699$ CAD (low season) to 1199$ CAD (high season – spring and summer). The filming crew cheated us again! This lovely scene was not filmed in the hotel room at Quebec but at the Presidential Suite of Grand Hyatt Seoul. To check out the official photos of the presidential suite, click this link and scroll all the way to the end. Staying at the presidential suite will cost you about $7000 USD/night and for the more affordable options, click here. If you’ve managed to be patient and scroll through the end of this post, I’ve got some good news to share!I will be working on something exciting for all my readers! In the next few weeks, I will be tidying most of these locations and summarize/position it in a form of a map or something. so you can better gauge how far each location is and plan accordingly. This will allow you to plan better if you do intend to visit these filming locations and you can gauge how far each location is and plan accordingly. Also, thank you for click and reading my post. I’ve just broken a new milestone on my blog for having the highest number of views in one single day! Thanks in Advance for helping me to break even on my yearly hosting/domain fees! There was a reader which commented that Goblin’s house interior looks similar to that of “Hello Monster/I Remember You” starred by Seo In Guk, Park Bo Gun and Jang Nara. I was feeling a little bored and I watched the drama (IT IS REALLY GOOD) and set looks THE SAME. Well I guess that did spend quite a bit of money to renovate Goblin’s house since he is like super rich in the drama but the stairs positioning is exactly the same. Sadly, I don’t think this studio will ever be open up for viewing.. Despite scanning through korean blogs and pages, I can’t seem to find anyone who has photo of the studio set. I guess the visiting area excludes this particular studio. On the other hand, if you do visit the set, you can see the Hanok houses and even a replica of the JSA blue house! Maybe one day I’ll visit this place, maybe. Hey~~ Thanks for your comment! I will continue to update more filming locations in time to come! hye, thanks for the info. but may i ask about goblin’s house interior? does that mean the whole house is a set only. i really love the interior design of that house ! i have yet to find information about that place yet but it is likely to be a studio. will update again if i find out. thanks for your comment! I, too, am very interested in the house interior. It’s gorgeous! Even if it’s mostly a set, I’d like to know if the set designers built it with an inspiration location in mind. Thanks for the great work on this page. Do you know where the grim reaper’s tea room is located? Can’t imagine a place filled with all those tiny spots for teacups! Hi there! I’m afraid I do not know where the tea room is located. I hope I will find it and update my article soon! Woah! So many places to visit! I also enjoy going to the filming locations. I’ve been to BBQ Olive Chicken Cafe, and planning to visit more places around Seoul. Thanks for this list! Yes there’s a long list of filming locations for this drama!! Thank you for sharing this. I plan to visit SoKor because of Gong Yoo. Looking forward for more updates. Thanks for your comment! I will try my best to update it as soon as possible! Hi there, yes I plan to do up a neater entry with english descriptions in time to come but I’m really busy these days which is why I can only post the sharing links..
Haaa… i love your post. I’ll go to Korea next week. I hope there’ll more update about filming location. Thank you for your comment! If you do visit these locations, please send me photos and reviews! Hi thank you for this post since it gives the names of the locations. I am particularly interested in the location or address of the house where the Goblin and Grim reaper live. Is it possible for you to help me out with this? I would like to find better pictures of the interior and if possible which would be even better the floor plan. Hi Wendy, I have a feeling that the house that they live in is a Studio Set instead of a real location that we can visit. The exterior of the house is part of a university – I have listed it in my entry. With regards to better pictures and floor plan, I’m afraid I do not have any of these. Hope you can find it somewhere else! Yeah. It’s like My Love From The Star, their apartements are studio set. I’ve been there when they make exibition. yep i’m hoping for the set to be on displayed after the filming is complete! Thanks for all the information! Now i wanna see the goblin house exterior! Do you know where the snowy scenes in ep 9 were taken? A walk way where goblin and the bride met. Alot of snowy white trees at the background.. Thanks for your comments! I have yet to watch episode 9 so I don’t know where the locations are but I guess I will update my post when I do find out! Are you on instagram or twitter? Hi there, my instagram is @flyhoneystars if you wish to follow! Glad that you found the information useful. Hi there, huge thanks to you for writing this very helpful information!! 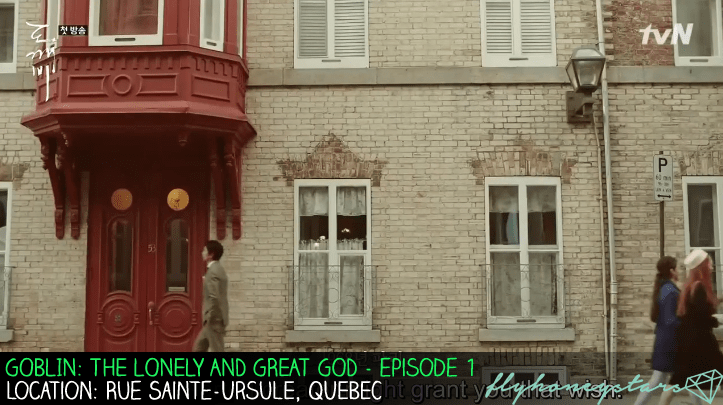 Just wondering if you know the location of the “red door” and the park (ep 2 – the scene where Gong Yoo caught the maple leaf & ep 4 – the scene where Gong Yoo is reading a book) while they were in Quebec City? Hi there, I’ve updated my post with the red door and fountain where Gong Yoo was reading the book. I’m not sure about the park where they caught the maple leaf though =( I guess I’ll update it again when I do find out! the park where they were catching maple leaves is Parc Samuel-Hollande in the Saint-Sacrement neighbourhood. my bro happened to spot them shooting there. I was so upset he didn’t tell me as we live about 5 min from there arrg! Thank you so much for this info. I’ll be visiting Seoul this March and this comes in very handy indeed. Regards! Thanks for your comment! Do come back and share with me your experience! Hi. Do you know the location of the umbrella scene where Goblin and Euntak first met? I want to know where that street is. Hello, I’ve just updated the list with your request. It is near Anguk Station and quite accessible and easy to find! Do share with me if you do manage to explore these locations. Thank you so much! I had a feeling it was around Anguk Station Bukchon area because I was there 5 years ago and it looked so familiar. Can’t wait to be back! Your post is a blessing! I probably won’t able to go to the ones outside Seoul but I will try my best. Also planning on going to Quebec in October and recreate their scenes lol! I just need to find a real life Goblin who looks a bit like Gong Yoo haha! Oh wells, going to Quebec definitely sounds easier than finding a real life goblin which looks like Gong Yoo. Haha! You’re so lucky to be able to travel so much~~ Quebec is so out of the way for me! I’m based in Singapore so Korea is ‘just’ a 7 hours flight away. I’m heading there in April and i’m quite excited about my trip as it has been 4 years since my last visit. I’ll be there till 7 May! but i might not be hovering around Seoul, gonna explore the entire south korea. heh. yep i’ll continue to update my blog with the locations. can’t believe that it’s actually gonna end in 3 more episodes time.. I know! 😢😣 So not ready for it to end yet. Anyway you must go to Jeju if you haven’t been. I haven’t been to Jeju yet =( I’m wanting to visit it after I find a reliable driver/friend that can drive me around.. Haha. Yeah driving around the island would be awesome. We did a taxi tour when we went. ahh. i want to be able to drive around on our own without a driver! I did a road trip with some friends to Hokkaido and it was really awesome.. Oh wells, I just have to find the right mix of friends that drive.. haha. Thank you for this article. I am currently preparing an itinerary for our trip to Korea and I came across your blog. Very helpful. It made my task easier. Good job! Glad that you found my blog! Please do visit the filming locations and come back and share your experience! I live in Québec City (I actually saw them filming!!) and I also wanted to add a location. There is one street which is refered to as Paris in the first episode and it is actually in Québec City. The street is Rue Sainte-Ursule. 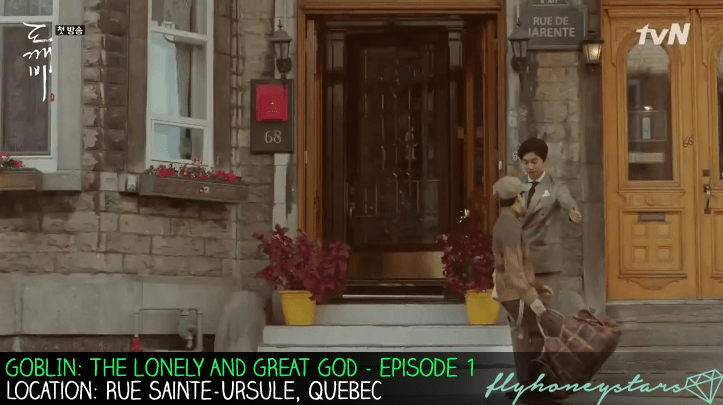 The address of the building where Kim Shin meets the young boy and the man, in front of two doors, is : 68 Rue Sainte-Ursule, Ville de Québec, QC G1R 4E6, Canada. Hey! Thanks for sharing on this new location and oh my gosh you are so lucky to see them filming! I’m sure many of us are dead jealous! I will update this information and credit your name. Thank You! oh my~~ you were so close!! was it very crowded when you saw him? Sometimes if there isn’t a lot of people, you can try your luck at getting closer! Hi Allanis, just saw your twitter and I was wondering of the location of this picture (https://twitter.com/petitehana_/status/822692822679744513), the photo on the left. 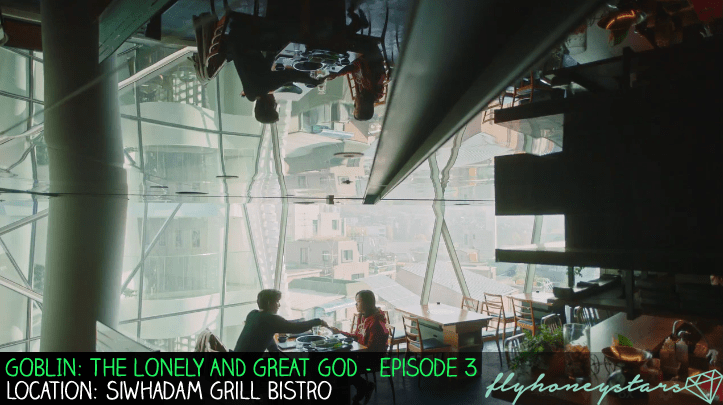 The scene is in episode 15 where Eun Tak and Kim Shin were eating something, it looks like a bridge with the hotel on the background. Hey, thanks for compiling the location for the drama shooting. Is there any information where is the location of the photo booth in episode 13 ? Glad that you found this post useful! I’m not sure about the photo booth though. Haven’t had information on it yet but I will update again when I have it! Hi, do you know which palace did they filmed the historical scenes? The scene where Goblin got stabbed with the sword. Hi there it was filmed at Naju Theme Park. 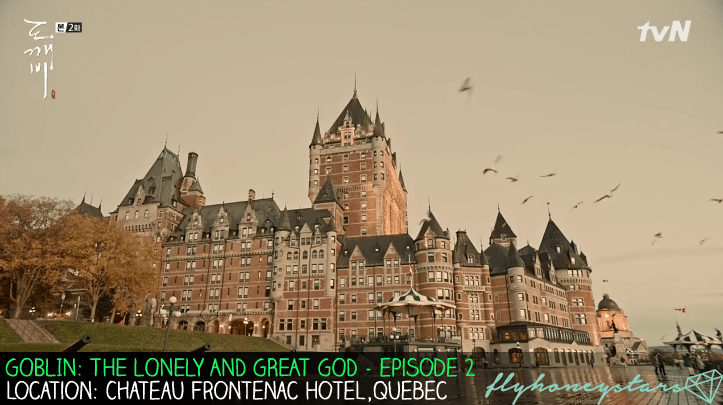 Hey, do you know the place in episode 14 where Eun Tak and Kim Shin were eating in Quebec? It looks like a bridge with the hotel in the background. Can you send me a screenshot of this footage? THANK YOU!! I was looking for this information after the quebec hotel replied me that it wasn’t their hotel.. THANKS A MILLION! You’re doing an amazing job really. I only do things like these off radar, it’s nice to see someone like you is actually sharing out there to the other fans. really glad to have the same hobby as you in location-stalking. heehee. Wow! I’m totally amazed at the effort you’ve put in and telling us the locations where the drama goblin filmed! Im so gonna go these places to take a shot! Withdrawal syndrome from the drama! Hahahaha will be waiting for your directions once you have the time to update! Thanks a lot!!!! Thank you for your kind comment! Yep I’m having strong withdrawal symptoms too! and the sad thing is that legend of the blue sea is ending this week too.. I haven’t found my next drama to ‘chase’ yet plus I’m pretty fussy so I’m not sure if i’ll just watch any drama. I have done up the comparison for the locations in Quebec (drama vs google street view) so I guess you can check that out in the meantime. Enjoyed your page greatly! I binge-watched the entire 16 episodes this past weekend, and then quickly bought all the songs from the series to my itunes. I only used a box & a half of tissues while watching! I wasn’t sure I would like it, being older than the main cast, but the plot was quite entertaining and the costumed bits were outstanding. Thank you for your great research on all the locations. The cinematography was awesome. Thank you again for all your information! I hope to travel to Quebec in about 3 years, so now I will have some sites to look for. And if one day I make it to Korea, I will surely seek out these wonderful places! Cheers from So. California! Hi there! Thank you for leaving a comment! It must have been an overwhelming weekend to have watch 16 episodes all at once!! I watched it week by week so there was a lot of anticipation while watching the drama~~ Please do visit Quebec (since it is somewhat nearer from California)! It looks so beautiful, especially in autumn! Hello! I am currently unsure about this location. I’ve read somewhere saying that it is the same place as “Secret Garden” drama but I can’t verify it on the daum/naver street view so I will only post the information once I have confirm that it is correct. Hope some readers can help me out too! Sadly, daum/naver street view does not cover that exact route but I guess it should be accurate since the writer visited the place back in 2012 for ‘Secret Garden’ and it does look the same as Sunny’s house. Ommo!!! Thank you so so so much <3 <3 <3 It is indeed Sunny's house since the blogger had confirmed it in her post. There are screenshots of Goblin episodes there! You are so great in researching! I should really commend you for it. I don't know how many thank yous will be enough for this. I guess if you follow the map in the blog, you should be able to find the place! Well, if I do get to visit this place during my upcoming korea trip (end Apr), i’ll definitely do a writeup in English! hi …. i want to ask did you know where did the place where the grim reaper serves tea and the only goblin and the one who die can enter ….? and applause to you admin …. because of your post i wll know the exact destination i want to visit in korea …..
Hi there! Thanks for leaving a comment! I do not have any information of the tea house.. I believe it is a studio setup. Coming to Korea in March, will definitely visit these locations. Thank you so much! Thanks for leaving a comment! Do come back and share your experience with these film spots ^_^ Will look forward to it! Thank you so much for the job well done. I am currently in Seoul and been staying around Jongno-gu area. I will check some of the shooting locations in Jongno-gu. Hi there, thanks for leaving a comment! Do come back and share your experience if you do visit these filming locations! wow! amazing that you managed to identify almost where the scenes were..
Hi there, thanks for the comment! Hope you find the information useful. Wow, please update more when you finish tidying most of these locations and summarize/position. I like it, thanks for sharing all of these amazing filming locations, one question, did you went to all of the locations by yourself? Hi there, I hope I will remember to update you when I’m done but it will take a while. Nope, I have yet to visit these locations as I haven’t been in Korea for the past 3 years! All the information were found online through extensive research and eye identification via the street view. Glad that you enjoyed this article! Hi there, this place is probably a studio set, not an actual site. Thanks for your hard work/ I want to know about the gold and black five peaks screen in the king’s palace. It is fantastic. Is it a piece of stage craft or is a work of art that I can investigate? Hi Bonnie, I am not sure about the thing you are asking about. Could you post a screenshot of it? Perhaps other readers might know what it is. Hey! update me please! I am planning to go to Korea! thanks so much! This is really helpful! Thanks for your comment! You can use this google map (https://drive.google.com/open?id=1LiWIsYQ4PB0_DHptyLZoMVFZRGI&usp=sharing) to help you plan for your trip. It will show you how near/far the locations are from Seoul. I keep feeling the goblin house looks like the house in ‘I Remember You/Hello Monster’ drama. Look at the stairs in both the houses. The stairs is exactly the same. The main structure of the stairs and the surrounding… it’s exactly the same! One is fitted darker, the other brighter and more glittery. There can’t be 2 houses with such similarity unless it is the same? Hey! thanks for leaving a comment. I have not watched that drama. Is it possible for you to provide some screenshots? I’ll try to do a bit of research about it in my free time! But if it is really the same house, it might likely to be a permanent studio set and I guess fans will not be able to visit unless they open it up for some exhibition or something.. Let’s see! I really enjoy and thankful for the filming sites details. It helps a lot to find them. You really did a good work! Thanks for leaving a comment! Glad that you find it useful. I guess the house interior is a studio set which means that it is unlikely to open up for public visit.. Thanks for leaving a comment! Glad that you found the information useful ^_^ Hope you get to visit these places some day too! you’re such a big help! thank you so much for this!!!! Kamsahamnida! Really appreciated what you have shared for the above posting regarding ” Goblin Filming Location ” very informative . I am very impressed with this compact and concise information that you have shared. In near future this posting will be my ” travel map to track goblin journey in Korea”. I personally thinks the internal filming location of goblin mansion , mainly are ( Self Created -” on the set/ shooting studio”, I commented on this due to I watched few of the goblin n off scene shooting it seems like ” special self created/ design shooting studio”. Remarks : I might be wrong , Goblin Fan from all over the world pls feel free to add in any comments .I feel sorry too as if in reality it is just a shooting studio and ruin your ideal or dream of ” Goblin Mansion”. Another possibility could be this shooting studio is still available in the TV Station , would appreaciate kindly let us know show there be any opening for public visit like per entrance fees. LOL above just a suggestion or wild guess-Golblin Fan pls add in should there be any further good update. Reading this made me even more excited to go back to Korea! Glad that you enjoyed this post! all the best for your trip in May and do share with me your photos when you are back! Hi there! I don’t think it is possible to enter the building of the exterior of goblin’s house! The interior was not filmed there anyway. It was probably a studio set. Anyway, so which other place did you manage to visit? you mean you cannot even walk near to the building? oh man =( that is so sad!! I have yet to visit it too.. I love your blog eonni! This helped me alot in finalizing our itinerary this april. And just recently “Moon Lovers: Scarlet Heart”. I specifically remember the courtyard as the setting of the narye (the ceremony warding off evil spirits from the palace AKA attempted assasination plot against the Crown Prince) & the rain ceremonies (where Wang So ended the drought and Hae Soo foresaw Wang So as King Gwangjong). Hi i love this article… im a fan of this K-Drama… i would like to ask is fo you have any news about the place where sunny and Eun-tak stayed in episode 14 to 16? The rooftop..
Hello, thanks for your comment! WOW!! such good info.. i plan to visit Korea soon, so these perfect info is such a blessing.. GOBLIN is indeed my TOP K-Drama now… Can’t get over it even though it end months ago. Maybe you can suggest the route in a MAP or something. So that a non-Korean like me (not familiar with the name of those places) can easily follow it. Hi there, it is hard to suggest a route as I’ve not visited the places myself. However, if you copy and paste the address to google maps or something, it should be able to mark out the route and directions for you. Sorry that I am not able to help. Hi there! Just want to thank you for this very informative and interesting article. My friends and I will visit Seoul this July and kinda excited to see these locations. Of course, Goblin brought us here:) Keep us posted and informed. I love you’re site! Would it be possible to have Kim Sunny’s loft interior? Hello, I am afraid that I do not have information about this. I was only able to comment and say my thanks now, but kept visiting your site when we were in Seoul to check the locations within our area.. Thanks to this I was able to reenact some of my fave scenes.. 😁.. posted the link to your site for info credit on my blog.. Thank you for sharing your writeup on the goblin filming location! So nice to see that you’ve successfully found the locations and I hope you had a great time in Korea too! whaaaa.. your blog is daebak! I already wanted to go to korea because of the beautiful places where the drama goblin shoots.. Thanks for your comment! I agree that Korea is a beautiful place too~~ Look forward to my blog entries about my Korea trip which should be completed in a few weeks time (I am currently in Korea)! However, I didn’t manage to visit any Goblin locations in this trip.. Oh wells. hah. I’m looking forward to the map that you’ll do.. Maybe I should start saving up to be able to travel to that places! 🙂 BTW , thank you for making this article.. I really hook up to this drama! I still can’t move on until now. 🙂 and also have a safe trip there in S. Korea! Hi there, i am not sure about that location either.. sorry! Do you know when they started filming and when they wrapped up their filming? Thank you! Hello, I am really not sure about their filming schedules but if I didn’t recall wrongly, they were spotted in Canada sometime in September for all the autumn footages. It was a live-filming drama which meant that they were still filming even after the drama started airing. During the airing schedule, there was a week without episode (they gave a special episode) because there wasn’t enough time to edit the special effects required for the drama. Sorry that I’m not able to help! Hi! Do you know where the grandfather’s mansion is? LOL remember the episode where Secretary Kim danced to Chairman Yoo Shin-woo ?? huhuhuhu I wanna know where that mansion is located :((( Thank you!!! Thanks for leaving a comment! I hope you will make it to Quebec in Spring where the leaves are all yellow!! I hope to visit Canada some day too~~ but I guess it will take me a while. Thanks for your comments but I don’t think I am able to help you with these locations as I don’t have much time lately. I’ll leave this comment open and hopefully some kind soul who reads it would be able to help. Pingback: Kunjungi Lokasi Drama Goblin “Gong Yoo” di Korea Selatan | Running Life & Enjoy! Thanks for your comment! 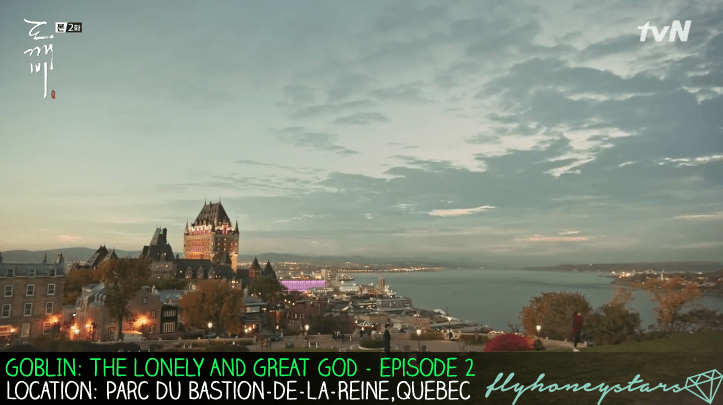 Visiting Quebec is good enough~~ It does seem very pretty from the drama. You are the best! 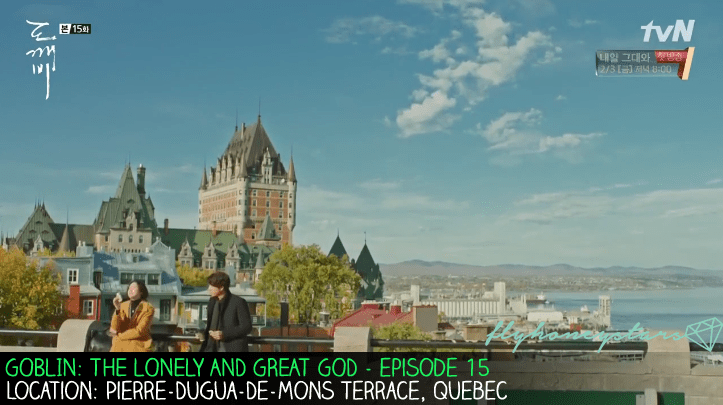 Thanks for all these locations, we’ll be traveling to Quebec – the closest I can be with my goblin just to see where he stood with Eun Tak…….thank you thank you thank you for all the exact locations. We will be traveling this fall! I can’t wait to catch that leaf! You’re so lucky to be visiting Quebec~~ Hope that you will be able to find all the locations! All the places and sets are beautiful. Clothes they wear look nice and expensive. I wonder how much they spend for this drama. No idea how much they spent but I’m sure they have earned enough in terms of sponsorship and filming rights..
MY GOD!! REALLY I´M VERY, VERY GREATFUL FOR THE INFO. 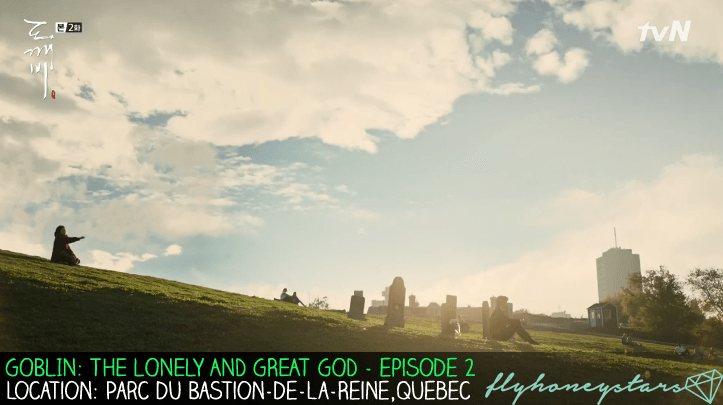 I´M PLANNING TRAVEL TO QUÉBEC FOR THIS DRAMA AND A I WAS LOOKING FOR ALL THE PLACES WERE THEY FILM IT! Thanks for leaving a comment! Hope you will enjoy your holiday in South korea and do come back to give some updates! Interesting! Thanks for sharing 🙂 Just wondering about the Baskin Robbins where Ji Eun Tak visit with Kim Shin and with Tae Hee? And Subway where Kim Shin eat after the movie date? Hi, I wanna ask you about the bakrey that have a blue box. When Eun tak blown the candle at the rooftop? i wonder if you could tell me where is coming from? I think that bakrey quite famous. Hi there! Thanks for your kind comment. I’m glad that my blog post helped you in searching for the beautiful filming locations. Hope that your trip to seoul was an awesome one! One day, one day’! I will visit all these places especially Québec ㅠㅠ Goblin unlock this beautiful place for me. Hi, a very informative post, thanks a lot! But do you happen to know too how to get back to Seoul from Borinara Hagwon Farm? Like if you’ll miss a transport bus or something if you left the place late? Hope to hear from you, appreciate it. hey! thanks for leaving a comment but I’m afraid I’m unable to answer your query as I’ve not visited the place before..
You just earned a new follower. 😂 Keep it up! Thank you for all of these information. Fighting chingu! At first I thought that the shooting location of the Goblin movie was in Paris. I didn’t expect Canada to have many similarities with Paris.